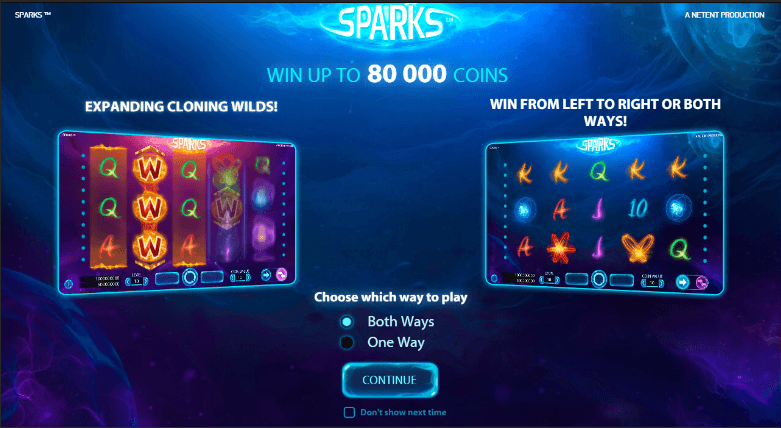 Sparks slot machine is one of the most interesting games by NetEnt, it is themed to be very exciting with so much energy and an electric vibe. If you are a fan of the previous games by NetEnt, then you will not be disappointed in this game. Though it is not entirely similar to the previous works by NetEnt, it will certainly remind you of the previous works. This slot is designed with 3 rows, 5 reels and 20 pay lines and it features win both ways’ and win one way’ mode to mix things up. To distinguish between the two modes, each mode is made with a different background. In the win one way’ feature, you win from left to right but more excitement is in the Win Both Ways’ where you can win on both ways; from left to right and from right to left. You should not worry about getting confused in the two modes as you can switch from one to the other at any desired time. After setting up the desired mode, you can select the level and coin to play for. The value of the coins ranges from 0.01 up to 2 and the level varies from 1-10. You can change these value at the bottom of the screen and by arrow blocks. In case you do not feel like using the mouse for each spin, you can use the auto play feature to set the desired rounds and relax while the winning combinations takes place on the reels. This is a unique and new feature exclusive to NetEnt only. The cloning wilds can appear on reels two and four and replace all the symbols. When you hit one of these, it will stand up or down or both ways but it can remain the same. NetEnt likes to break out from the norm on almost every slot they release and they haven’t disappointed in this one too. The substituting wilds can appear anywhere on the reel and replace all the symbols except the expanding cloning wilds. If you manage to get more than three substituting wilds, you are awarded some generous wins. In a regular game, the max win cannot exceed twenty times but you can win up to 400 times your stake in the expanding wild feature. Therefore, you can get 80,000 coins but you can only achieve this jackpot payout through the bonus game where you can bet a maximum of 200 coins per spin. 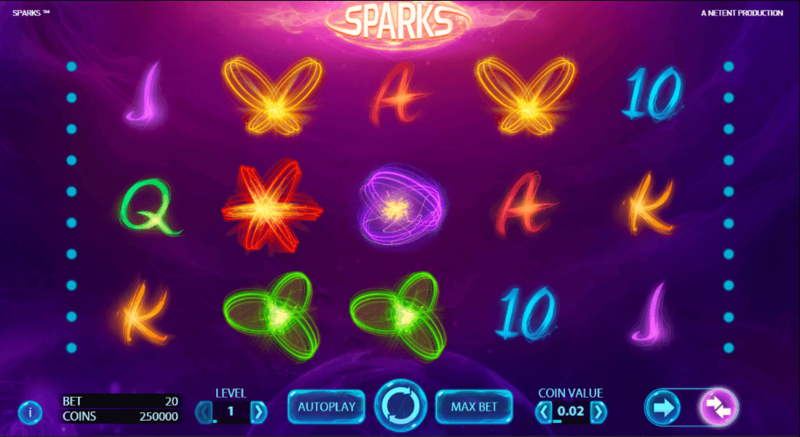 Sparks slot machine by NetEnt guarantees an exciting time on the reels. The combination of blazing neon themed graphics and enticing sounds ensures that you get a complete NetEnt experience. Now you must be ready and am sure cannot wait to get your hands on this unique slot by NetEnt. However, choosing the right casino to play in for real money is a bigger hustle that getting a game you will enjoy. You should look for a casino with a safe gaming environment and high quality games. Below is a review of the two highest rated casino that you will definitely enjoy playing this game in. Vegas paradise is one of the best casinos where you can play this game from. They offer flash powered, no download required gaming platform packed with a wide variety of games from NetEnt, Wagermill, Leander games, Cryptologic and mMicrogaming. After signing up to play in this casino, you can play a wide range of mobile games that are compatible with Android, tablet devices, iPhones and Blackberries. You can also play the live Dealer games. After signing up as a new play in this casino, they double your first deposit with a match bonus where you will get $200 in bonus cash. Jackpot Paradise casino also does not disappoint. It has games from Microgaming, Quickspin, Quickfire, Sheriff Gaming, Nyx, Cryptologic and NextGgen which are managed through the Extended Thirdd Party Interface (ETI) and the Microgaming platform. It also offers instant play games from the above software providers and a wide range of mobile games which can run on Android devices, iPads, iPhones, Blackberries and windows. As a new player, you will receive 100 per cent match bonus and $200 when you make the first deposit. You also get other promotions and bonuses such as spin the slot offer and the Monday madness promotion.